By default, FileThis sends you an email every time it delivers a document from one of your accounts. In addition, if FileThis has trouble delivering a document, you receive a notification. If you’d rather not receive these notifications, you can customize the notifications you receive. 1. Click Hello, [Your Name] in the upper-left corner of the FileThis window and select Preferences from the menu. New Documents Are Delivered: Receive an email every time FileThis Fetch collects new documents. There Is a Problem with a Connection: Receive an email if FileThis Fetch is unable to collect documents (often due to a changed password). 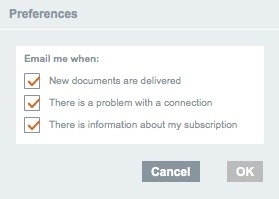 There Is Information About My Subscription: Receive an email when changes occur to your FileThis Fetch subscription. 3. To save your new notification settings, click OK.
3. Scroll down to the Email Notification settings. New Documents: Disable this if you don't want to receive email every time FileThis Fetch collects new documents. Problem: Disable this if you don't want FileThis Fetch to notify you when it is unable to collect documents (often due to a changed password). Subscription News: Disable this if you don't want to be notified of any changes to your FileThis Fetch subscription.